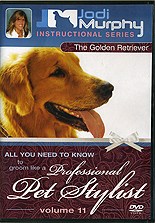 The Golden Retriever is the all-American family pet. It is our job as groomers to keep the shedding hair down to a minimum for our clients. This session will start from the most important step of this grooming process, the bath. Jodi will demonstrate de-shedding techniques and proper drying techniques for this breed. Learn how to make this breed look natural and untrimmed.